The name “Havanese” probably is derived from the city of Havana, the capital of Cuba. The first Havanese ancestors (Bichon Frises family of dogs) were brought to Cuba from Spain after Columbus first claimed that country for Spain in 1492. These dogs began to interbreed and developed into the Havanese we have today. Wealthy families in Cuba loved these little dogs. They became popular in Europe when travelers brought them back with them to England, France, and Spain. However, like some breeds, this one almost became extinct. After the Cuban Revolution in 1959, eleven Havanese were brought to the United States with their owners. Almost all Havanese in the U.S. today are ancestors of these eleven dogs. Havanese are delightfully affectionate and make wonderful family pets. They love to be part of the family and get along well with children and other pets. They are gentle, clever, active and cuddly. Havanese love to perform tricks, and you can tell by their tilted head and animated face that they make great listeners. They also love to cuddle up with you or sit in your lap. They are energetic but don’t need a lot of exercise and will get most of their exercise by running around your house. The Havanese are all-in-all a fun and devoted family pet. Havanese usually weigh between 7 to 13 pounds and stand approximately 8 to 11 inches tall. The are sturdy and compact in build. 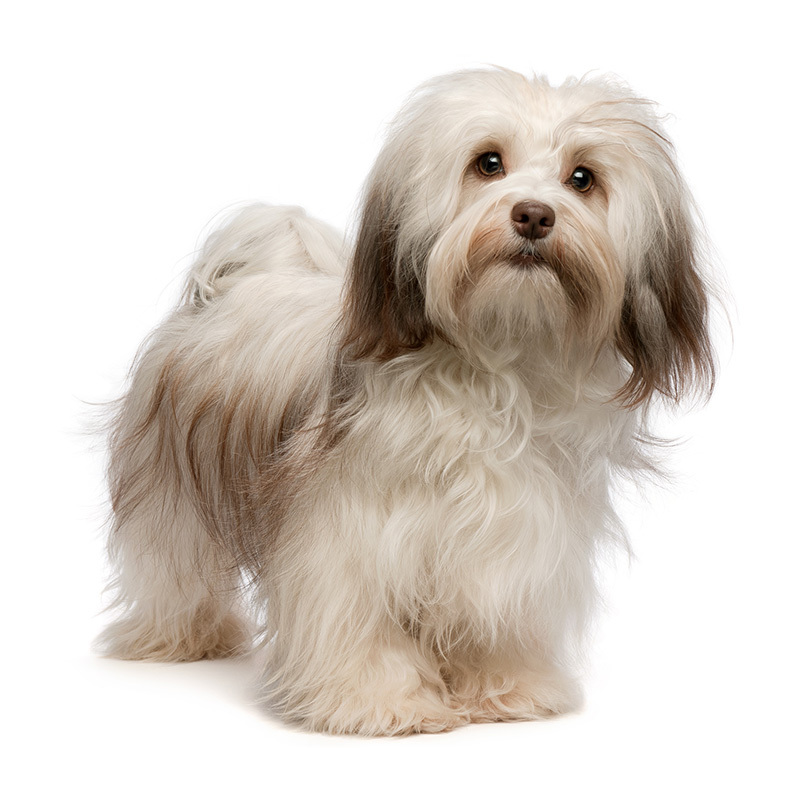 The long, silky coat of the Havanese is beautiful but requires regular care. The colors of their coat range from white, brown, tan, to gray. Havanese are the 15th most popular dog registered with America's Pet Registry Inc. Their nickname is "the Velcro dog" because they stick so close to their owner's side. They are quite trainable, and they've worked as assistance therapy dogs.